The very definition of the musical genre called Americana is: “a genre of American music having roots in early folk and country music”. But every so often, someone from outside of America comes along who adds their flavor to the music. That outside influence from the likes of someone like New Zealander Keith Urban helps to keep the music fresh as that artist helps to push the boundaries of the music. You can now add yet another outsider influence to the Americana music genre as the band Hometown Marie is currently ripping up the Country charts over in their country of Sweden. Sweden’s Hometown Marie takes the Americana genre and makes it their own. In fact, if you were not aware of just where the band comes from, you would swear they were just your average American Country band. The Swedish band consists of: Oskar Östman, Singer, songwriter, guitarist; Gabriel Carlsson, Bass, vocals; Simon Peterson, Drummer; and Accel Ramberg, Lead guitarist. Together, the quartet has released one four-song EP in 2016 entitled Wild Side and two new singles that were added to the band’s musical output in 2018. Hometown Marie’s Wild Side EP begins with the track “Like We Used To”. Right from the very beginning, the track screams Top 40 Country radio as the track features a strong current Country music feeling. In fact, the song feels as if it was recorded down in Nashville with some of the best professionals in that town. “Like We Used To” features strong mandolin playing and plenty of Country twang. The mid-tempo pace of the track gives it an easy feeling as the song plays out. That tempo works well for the song as the lyrics describe a couple in the middle of a dance that takes them back in time to when they met each other. Being the first track off of the Wild Side EP, “Like We Used To” lets the listener know that the band is serious about creating music in the Country vein. The band picks things up a bit with the track “Yours Tonight”. With“Yours Tonight,” the band ventures into a sound where the band combines elements of Folk music with Country. The result is a slightly lighter feel to the music. But that lighter feel comes with a quicker tempo to the music and a slightly heavier groove than what was present on “Like We Used To”. The inclusion of the mandolin at the very beginning of the track helps to set the song in motion. It is that mandolin that truly brings the Folk influence in the song to the forefront. The quicker pace and stronger groove to the song creates a moment on the EP that would fit right in with anything on today’s Country music radio formats. Just as fast as Hometown Marie changed the pace of the music with a faster tempo on “Yours Tonight,” the band tones things down again on the next track of“Run to You”. The tempo for that song is much slower but the track also comes with a very steady, yet strong beat provided by drummer Simon Peterson. The slow pace and steady beat of the song carry the track throughout its four-minute playtime with no changing of the pace or delivery of that beat. Along with the slow, steady beat from Simon Peterson that is present on the track,the rest of Hometown Marie adds to the track with instrumental deliveries that are rather sparse in nature. The limited amount of playing from the band members on the song help to create a track that rather simple in nature yet somehow also seems full-bodied at the same time. The Wild Side EP from Hometown Marie comes to an end with the album’s title track. “Wild Side” is easily the hardest rockin’ track of the four songs that make up the 2016 release. The harder guitars and stronger beat on the track blend together to create a track that is perfect for fans of today’s Country music. And the mention of a “Hollywood Smile”in the lyrics adds even more of an “American” feel to the music, which just helps to put the band further into the Americana music genre. For those fans of today’s Country music, “Wild Side” is one track that will fill your need for Contemporary Country music. 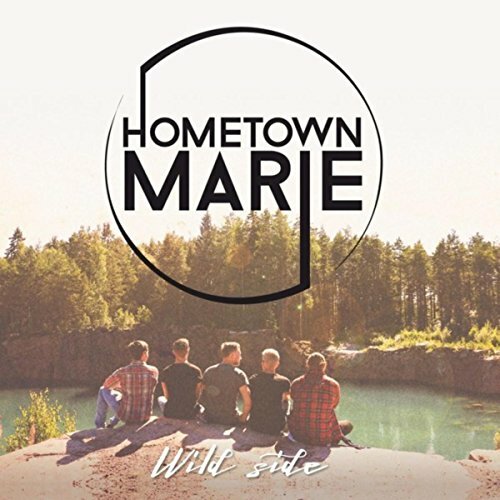 While the four tracks that make up the Wild Side EP from Hometown Marie are solid, there is more to the band than just that EP. The band has just recently added two more tracks to their musical library. Those new tracks are “Stay The Night” and “Take Me Back”. Right from the beginning of the track, “Stay the Night” from Hometown Marie hits the listener with a sound that places the Rock and Roll influence of the band atop the band’s Country influence. While both genres are solidly present in the song, the track contains more of a Rock and Roll influence than Country twang. The track also seems to also contain other influences to the music as well. For instance, the entire track is rather reminiscent of a song from the Scottish rock band Big Country from 1988 called “King of Emotion”. Whether there is a connection between that song and Hometown Marie remains to be seen. However, the resulting track by Hometown Marie would have fit on American radio airwaves back in the eighties just as easily as it would on today’s radio. The second track that the band just recently released is called “Take Me Back”. The introduction to the track finds the band slowly leading into the track as the track builds. As the song builds, what is revealed is a song that contains a strong influence from eighties-era Rock and Roll with just a little Country twang. The lyrical content about a man asking for forgiveness has a universal appeal to it and the musical approach of the track combine to create a track that fans of Rock and Roll of the eighties and fans of today’s Country music will both enjoy. Swedish band Hometown Marie may not have an album of music available, but the Wild Side EP and the band’s two newest singles of “Take Me Back” and “Stay the Night” provide the listener with six tracks of strong music with plenty of crossover appeal for those who enjoy Rock and Roll from the eighties and/or fans of Country music. Whichever side of the aisle you find yourself on, Hometown Marie creates music that appeals to a lot of people. To hear the music of Hometown Marie, check out the music video to the band’s newest single, “Stay the Night“. You can find Hometown Marie and their music over on the band’s Spotify account.